Ever had those moments when you're completely stuck on a gift idea for someone? 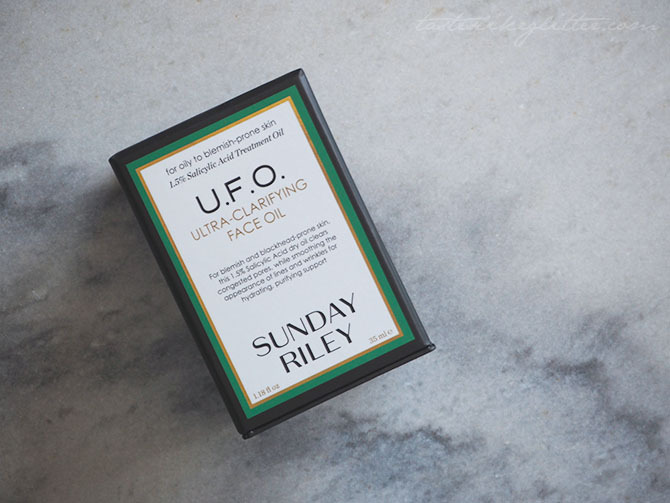 Especially if you don't know them very well, Lush have a huge range of gifts ranging in price so there's definitely something for that special person. 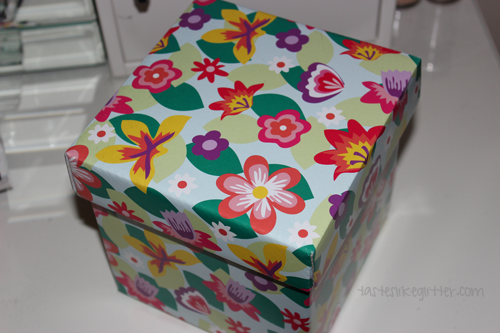 I managed to amass 3 of these lovely little gift boxes over the Holidays and my birthday, in this post I'm going to show you two. 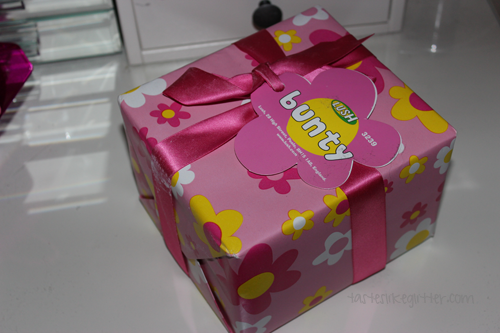 First up we have the Bunty gift boxed priced at £13.50 and containing 4 bath items. It even comes all wrapped for you so if like me, you fail at wrapping, this is perfect. Creamy Candy bubble bar, Butterball ballistic, Keep It Fluffy purple ballistic, mini Comforter bubble bar. I was super pleased when Callum (bestie) presented me with this for part of my birthday present. Though I knew he had Lush as I could smell it before he took it out of the bag. I've tried all these things in the past and I love them. 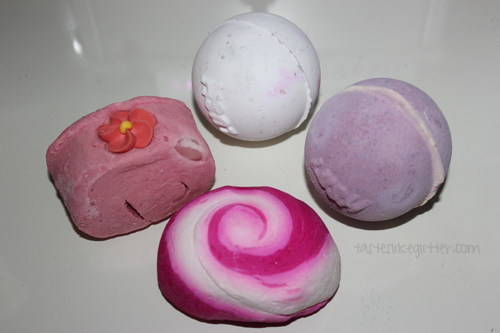 The Bubble Bars are two of my favourites and how cute does the Mini Comforter look? It reminds me of the Candy Cane bubble bars of previous Christmas collections. Definitely perfect with those with a sweet tooth. It even comes in two choices of wrapping, pink or yellow. Next up I had the Lovely Day gift box from a family friend for my birthday. This is £19.95 for six products, 4 are full sized. 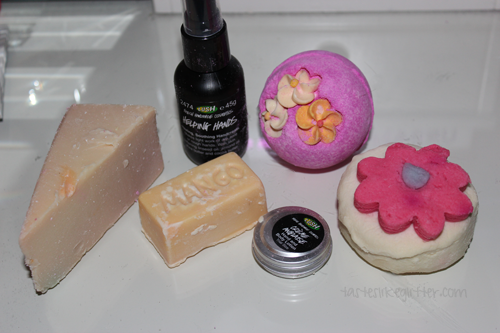 Wedge of Honey I Washed The Kids soap, trial size Helping Hands hand cream, You've Been Mangoed bath melt, Think Pink ballistic, trial size Crème Anglaise, Pop In The Bath bubble bar. This perfect if you're not sure what they're into. It has a range of fruity, sweet and honey scents. The only thing I haven't tried from these is the You've Been Mangoed and the Crème Anglaise. I love everything else though Honey I Washed The Kids would be my favourite. I'm not a big fan of Helping Hands but these are the perfect sized bottles to hand out to others if they want to try it. The gifts range in price from £5.50 being the cheapest for a soap stack and the Lush Legends being the most expensive at £100. On the website they have a sidebar on the gift page where you can select who you're buying for, whether that be your best friend, boss or even your Dad. 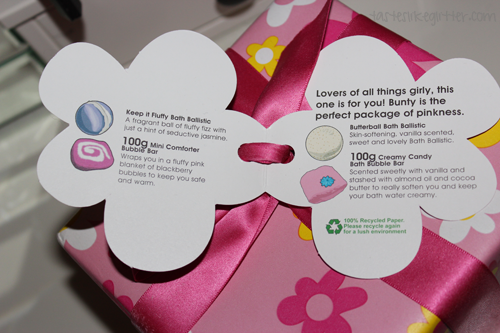 If you're stuck on ideas these make the perfect gift as they're not just your regular bath products. 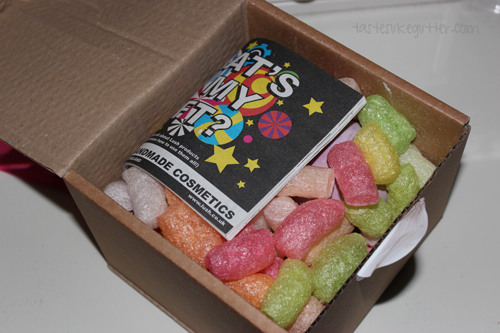 I would be pleased to get any of these boxes but maybe that's just me and being a big fan of Lush to start with.